Some people travel all around Europe to see the sights and famous attractions. You don’t have to go outside The Netherlands to see beautiful lakes, rivers and the sea. Giethoorn is called “Venice of the North” and for good reason. The relaxing beauty of a little town filled with canals is a sight to see, and experience. PrivateTaxiTours.Amsterdam offers a unique taxi tour to the remarkable town of Steenwijkerland in the Dutch province of Overijssel. 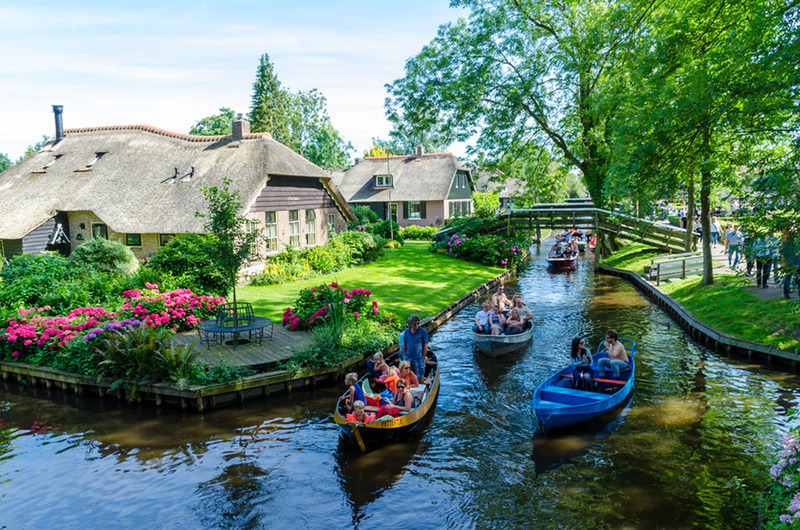 We will show you the highlights of Giethoorn on this page, for our low taxi rates or more information feel free to contact our staff. Sure, the middle of the winter is probably not the best period to call PrivateTaxiTours.Amsterdam for a tour to Giethoorn, but in the summer you can really experience the unique features of this remarkable town with its canals and over 180 bridges. You can walk around the town, go on a boat for a group tour or even better; rent a small motorboat and go for a little trip through the canals. The center of the town is not accessible by car, so you can enjoy this restful place to the fullest. And if you want to see or do more, you can enjoy the culinary highlights in the restaurants or visit one of the nice little shops around town. There are over 180 bridges over the canals in Giethoorn. Giethoorn is popular with Chinese tourists in particular, about 200,000 people from China visit this little town every year. Although there is a bicycle road now, before you could only travel by (small) boat on the canals. In 1958 famous Dutch filmmaker Bert Haanstra shot the movie “Fanfare” in Giethoorn. At about five kilometers distance from Steenwijk, a ride with PrivateTaxiTours.Amsterdam is a very convenient way of getting there and back. Experience “Venice of the North” with PrivateTaxiTours.Amsterdam, call us now for our special rates.